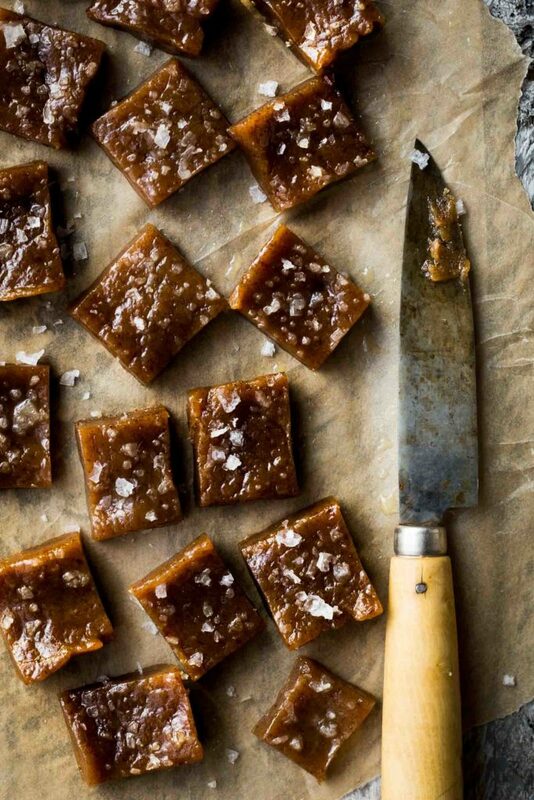 Cheers to easy homemade caramels! To the bowl of a food processor combine the dates, cashew butter, coconut oil, vanilla and cardamom. Process until completely smooth and creamy, scrapping down the sides as necessary. If the oil separates a bit you can pour it off the top. Taste test and set aside. Line an 8 by 4 inch loaf pan with parchment paper. Use a spatula to smooth the mixture evenly over the bottom of the pan. Sprinkle with the finishing salt and place in the freezer until firm. About 45 minutes. Remove from the pan and use a sharp knife to cut into bite size pieces. These are simply the best! We’ve made them four times since you first posted and they are just as satisfying as a chocolate bar. Thank-you for another great recipe. this recipe is so nice and i will keep and save this article for my blog , can’t i ?